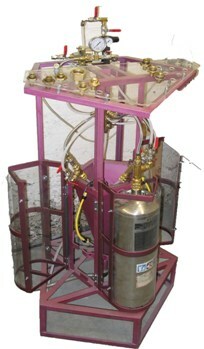 A low cost holding device with multiple positions with Floor Stand. Specifically designed for servicing the Cartridge type Extinguisher. Permits the operator to couple transfer line whereby one extinguisher can be emptied to another extinguisher or to the recovery unit or vaccum chamber while screening the powder as it leaves the extinguisher being emptied. 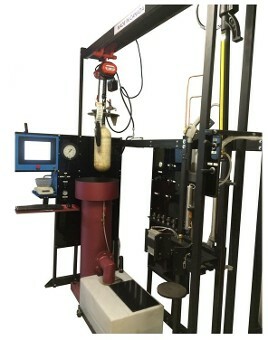 Designed to receive a sample of chemical from an outside source for examination without contaminating the system. 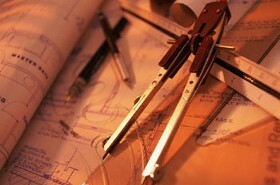 The sample may be extracted from a pressurized or cartridge unit. Essential for carrying out annual maintenance on the cartridge extinguisher. 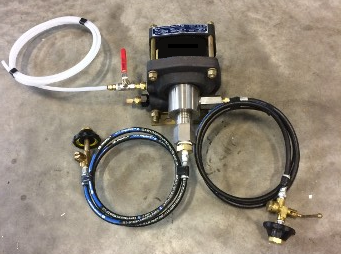 Allows the recovery of powder from anywhere utilizing a vacuum principle. It will pull powder from a partially filled extinguisher or from a pail using a screened Wand. 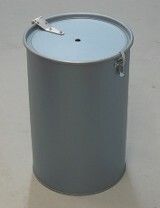 Directly coupled to another module it will empty the the contents into a recycled pail for examination, reuse, or disposal. It permits the complete purging of your system should it become contaminated. 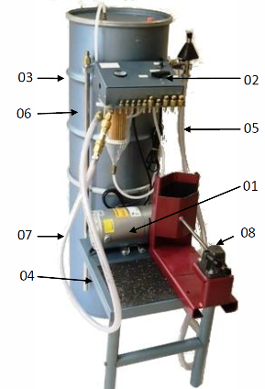 The Extractor has been designed to transfer chemical directly from the supply pail to the extinguisher or to the vaccu chamber. It has a screened outlet which prohibits the entry of foreign matter or lumps in the recipient container. 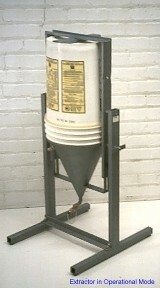 As seen on the photo, the supply container is deposited on the base of the swivel assembly and locked into position, the cone is lowered onto the rim and locked into position and the device is ready for operation. The right product for the right price!